A Hebrew bible scroll dating to 500 CE, found in Ein Gedi in 1970, has been deciphered for the first time thanks to cutting-edge technology. Cutting-edge technology has for the first time allowed scholars to read the most ancient Hebrew scroll found since the Dead Sea Scrolls, Israeli and US experts said on Monday, AFP reported. 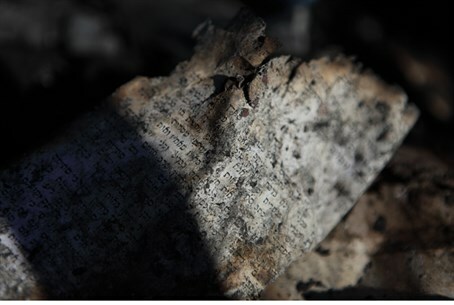 The charred piece of parchment from the sixth century CE was found in the ashes of an ancient synagogue at Ein Gedi, on the shores of the Dead Sea, in 1970 but until now has been impossible to read. "The most advanced technologies allowed us to virtually unroll a scroll, part of a bible, from about 1,500 years ago," said Pnina Shor of the Israel Antiquities Authority (IAA). "After the Dead Sea Scrolls, this is the most significant find of a written bible," she told journalists. Archaeologist Sefi Porat was a member of the team which excavated the ruins in 1970. "We tried to read it right after, but with no success," he said. "We didn't know what was hidden there with the technology of the time." The fragment measuring seven centimeters (two and three-quarter inches) in length resembles a peace of charcoal. It has now been found to contain the first eight verses of the Old Testament book of Leviticus, which lay down the rules for ritual sacrifice, said Shor, head of the IAA's Dead Sea Scrolls projects. Kept in the IAA's dark, climate-controlled vaults along with the Dead Sea Scrolls themselves, the parchment remained a closed book until last year when Israeli company Merkel Technologies volunteered the use of its micro-CT scanner. The resulting 3D scans were sent to the computer science department of the University of Kentucky, which developed digital imaging software and delivered the first images last week. Shor said she believed the complete scroll would have contained the whole of the Torah, the Jewish bible, but Kentucky University professor Brent Seales said it was too early to know if any more information could be retrieved from the Ein Gedi parchment. "We're really not sure. It's such a technical challenge," he told the news conference through a video link. "We know there is more though." Shor said the discovery filled an important gap in between the Dead Sea Scrolls, written more than 2,000 years ago, and the 10th century Aleppo Codex. The 870 Dead Sea Scrolls were discovered between 1947 and 1956 in the Qumran caves above the Dead Sea. The oldest of the documents dates to the third century BCE and the most recent to about 70 CE, when Roman troops destroyed the Second Jewish Temple in Jerusalem. The Aleppo Codex was written in the Galilee in the 10th century CE and named for the Syrian city to which it resided from the late 14th century until it was smuggled to Israel in the 1950s.